Sweet cicely is a perennial plant; the thick, bundled roots produce branched stems from 1 1/2 to 3 feet tall. The alternate, ternate-pinnate leaves grow on sheathing petioles and have ovate to oblong-ovate leaf segments. 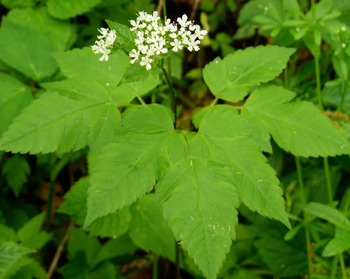 The inconspicuous white flowers grow in loose compound umbels during May and June. The whole plant has an anise-like odor, very sweet, aromatic, fleshy; stouter and nearly smooth compared to O. claytonii. This sweet cicely is a soft-hairy perennial abut 1-3 feet tall. The root is rank-tasting and the leaves fernlike, thrice-compound. The flowers are tiny, white and appear May to June. This sweet cicely is a bushy perennial; has a thick root and bright green, fernlike leaves, borne on branching stems that resemble parsley. Very small, clustered white flowers bloom in May and June and are followed by dark brown to black seeds. All parts of the plant are edible and taste and smell like anise. The flowers retain their anise perfume after drying. Grows in the woodlands of Canada, Alaska, and southward to Colorado and Georgia. Found in moist woods; Nova Scotia to North Carolina mountains; Alabama, Arkansas to Canada. Grows throughout Europe and the British Isles, and while not common, it is naturalized in the United States. Grown everywhere in the United States except along the Gulf Coast and in southern Florida, where the winters are too warm. Some references claim sweet cicely belongs to the parsley or carrot family, but Webster’s Dictionary states clearly that it belongs to the umbel family. There is an herb known to the Blackfeet Indians as Paoh-coi-au-saukas; it is called sweet cicely (Washingtonia divaricata). “Smell mouth”. Roots placed in mares’ mouth, and made to chew them. Drinks more water, and put them in good condition for foaling. The green seeds taste like licorice candy. Throughout the writings on sweet cicely are references to other plants it resembles: chervil, ferns, hemlock, and anise. Sweet cicely is the herb that just doesn’t seem to have a personality of its own. The plant is strongly scented. Curiously, the plant has no recorded history of use for its scent, its botanical name, Myrrhis odorata, is derived from the Greek for perfume. One herbalist reports that in sections of England it is called the Roman plant and suggests that this name may be a clue to its original introduction. Sweet cicely (Washingtonia divaricata) was known to the Blackfeet as “Paoh-coi-au-saukas,” or “smell mouth.” The roots were placed in a mares’ mouth, and made to chew them. The mares drinks more water, and puts them in good condition for foaling. The root is used much like anise. Taken for flatulence, mucous congestion, indigestion, and lack of appetite, alleviates cramps and nausea, parturition (childbirth) and relieves flatulence and, especially in infants, colic. Is useful as an expectorant for coughs. 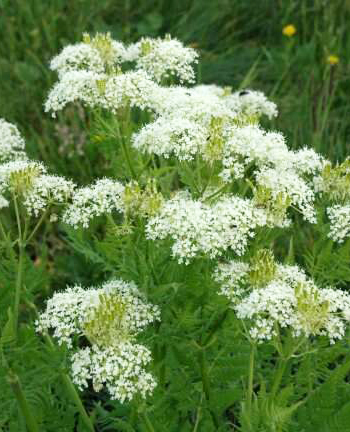 Sweet cicely water promotes milk production in nursing mothers, and a soothing eyewash. Said to promote the onset of menstruation when taken as an infusion. Sweet cicely oil helps relieve cramping, and spasms and is good as a stomach tonic. For insomnia, that a few seeds in a glass of hot milk before bedtime. Can be made into a salve to use for scabies or lice. Native Americans poulticed the root on boils, wounds. 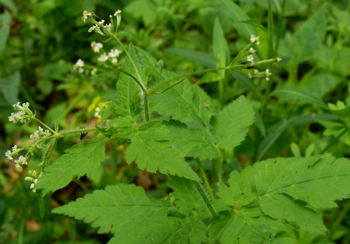 Because of its sweetness, sweet cicely is a good additive to improve the flavor of other medicines. The root was eaten raw or soaked in brandy. Native Americans chewed the root or gargled root tea for sore throats; poulticed root on boils, cuts, sores, wounds; tea as a was for sore red eyes, and relieve coughs. Anise like; fresh root eaten, it is said to be a gentle stimulant for debilitated stomachs and good for coughs and flatulence. The infusion of the root is said to be good as a tonic for young girls. The juice applied externally, helps to heal ulcers. Helps increase appetite and aids onset of menses. All three species listed in this report should be carefully identified before use.